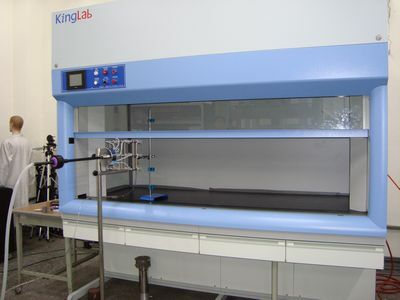 kingLab > Products > Lab Bench and Cabinet > Steel Frame PP Cabinet Lab B. It has a steel frame structure, a mounted PP base cabinet, and a countertop made of chemical-resistant board for laboratory use. The product features the advantages of steel structure and PP material, which make it suitable for a chemical laboratory.